As an archipelago on the westerly edge of the Pacific, the Philippines is one of the most exposed countries in the world to tropical storms, sea surges, typhoons, and tsunamis. The biggest storms can be catastrophic: 2013’s Typhoon Haiyan alone caused more than 6,000 deaths and US $2 billion in damages, leaving millions homeless. But battling the seas is a fact of life in the island nation. Between 2005 to 2015, 56% of property damage in the Philippines was due to typhoons and storms, and another 29% due to floods. 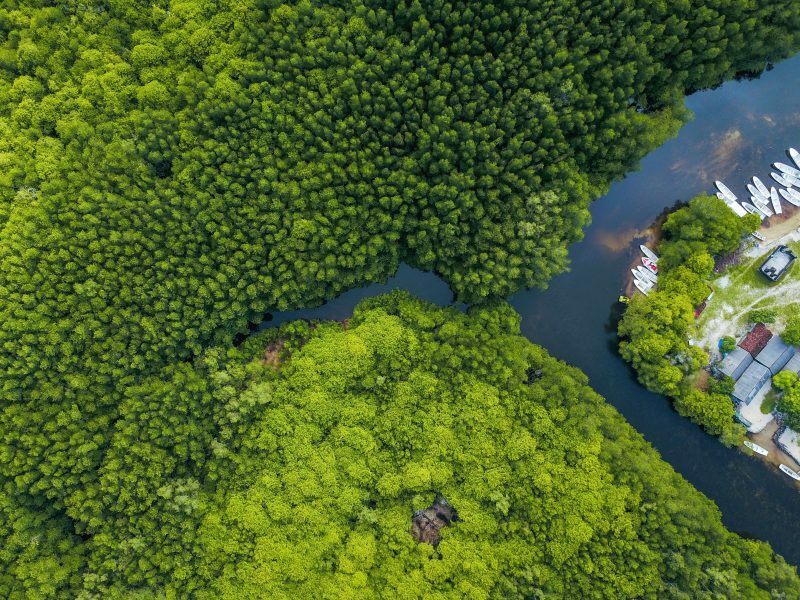 Now, thanks to pioneering new work done by the World Bank’s WAVES partnership, the Philippines has a new defence against seawater: the dense mangrove swamps that once covered vast swathes of the coastline. Mangrove forests form dense thickets of knotted trunks, with thick roots reaching deep into the muddy soils. They prevent coastal erosion, slow down oncoming wind and waves, and dissipate floodwaters more effectively – and efficiently – than man-made structures. They also support complex ecosystems, provide livelihoods to fishing communities, sequester up to four times as much carbon dioxide as tropical rainforest, and help maintain river deltas and transport channels. A 2017 WAVES report set out to measure the economic benefits of the Philippines’ mangroves, and made some remarkable discoveries. Across the Philippines, mangroves avert more than US $1 billion in flood damages to residential and industrial property every year; averaged out, each hectare of mangrove provides more than $3200 of flood reduction. If existing mangroves were lost, the number of people affected by flooding each year would increase by almost a quarter – many of whom already live in poverty. Damages to residential and industrial property would increase by 28% to more than US $1 billion annually; and 766 km of roads would be flooded. Although the research was specific to the Philippines, the economic value of mangrove flood defences to communities around the world is clear. Troublingly, mangroves in the Philippines and around the world are already in retreat. 19% of the world’s mangroves were lost between 1980-2005, and the Philippines alone has already lost some 80% of its original mangrove cover - in part because policymakers have not adequately valued these natural defences. Uniquely, the WAVES study also quantified the value lost from this destruction. Mangroves lost between 1950 and 2010 have left more than 267,000 people facing floods every year. Restoring these mangroves would bring more than US $450 million per year in flood protection benefits – as well as providing jobs and economic opportunities for coastal communities. As the risks to the Philippines from tropical storms continue to increase thanks to climate change, recognising the value of existing natural defences is of utmost importance. Proper quantification will lead to better policy decisions, and also enables the design and implementation of innovative new financial mechanisms – such as environmental impact bonds or parametric risk insurance – with which to finance the protection and preservation of this vital green infrastructure.